DON''T SEE THE SIZE YOU WANT? CALL US, WE DO SPECIAL ORDERS. 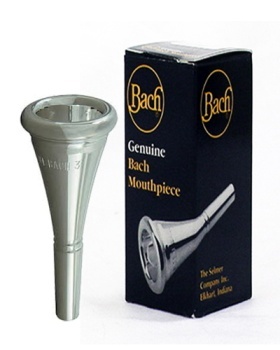 Bach Standard Series mouthpieces are some of the most popular mouthpieces in the world among both students and professionals. 11 / Medium Deep / 16.55mm / Medium Wide Rim Shape / Bach's best selling model, with cushion rim and brilliant heroic tone. Players who do strenuous work prefer this model. 12 / Medium Deep / 16.50 mm / Narro Rim Shape / This rim gives greater flexibility to players with a rather delicate embouchure.